SessionLinkPRO | Recording | SessionLinkPRO - Professional far end recording through your web browser - more than an ISDN replacement / ISDN alternative! What is SessionLinkPRO | Recording? 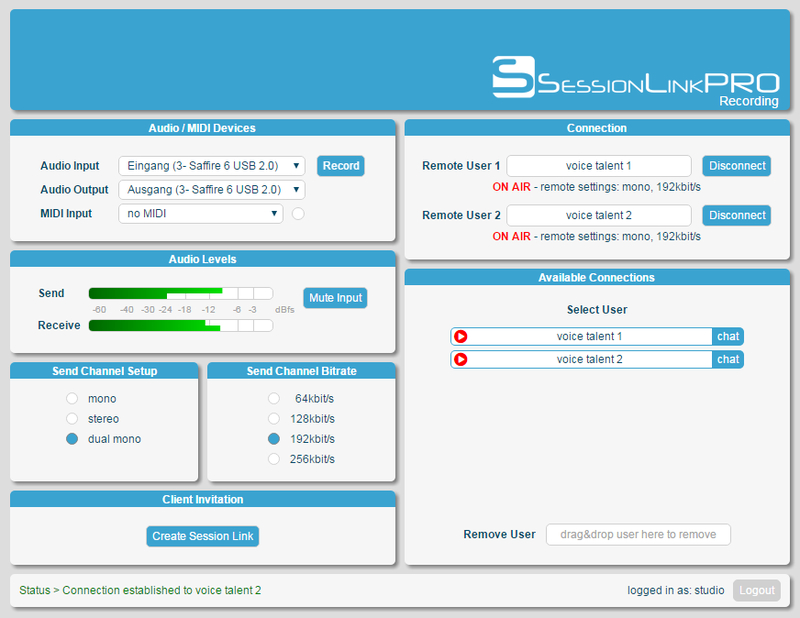 SessionLinkPRO | Recording is a browser based professional far end audio recording solution that works through broadband internet connections. With a Chromium based browser like Chromium, Google Chrome, Opera or Yandex there usually is no need to install additional software. Mono connections with up to 256kbit/s and stereo connections with up to 320kbit/s offer low-latency bi-directional audio transmissions in studio quality – at a fraction of the costs of ISDN transmissions. Dual mono allows to connect with two guests simultaneously, including full channel separation. An additional MIDI-channel makes it easy to sync the remote DAW. All of this makes SessionLinkPRO | Recording a perfect ISDN replacement! The user interface is clean and intuitive. Everything is set up by one participant of the connection. The other participant receives an invitation via email – the session link. Open it in the browser and… That’s it! SessionLinkPRO | Video is a free add-on featuring bi-directional video transmission. Use it in normal mode, full screen mode or detach the video window to scale and position it as you like.